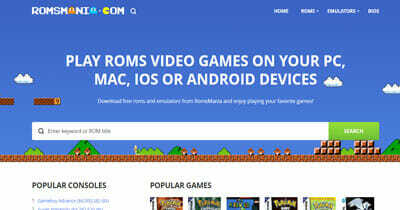 There are several rom sites available on the internet which helps you in downloading ROMs for your games for playing on Emulators and other programs. But all websites are not safe. Some contains annoying ads while some are just plain virus and nothing else. Now, the question arises then how to zero down on the kind of rom sites which are not only reliable and safe but also working too. And as this one is a path less travelled for many people I thought of working on this. In this article, I am going to let you know about the 10 safe rom sites to download ROMs for your games. Let’s get started with no time. 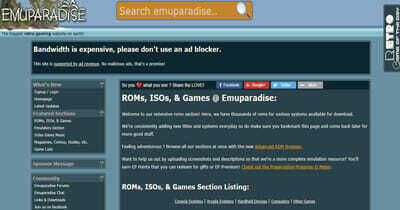 Those who are frequent in discovering retro games and stuff would definitely know the thing that Emuparadise is not just amongst the safe rom sites but also one of the most useful tool too. They have thousands of ROMs available for a variety of systems to download. 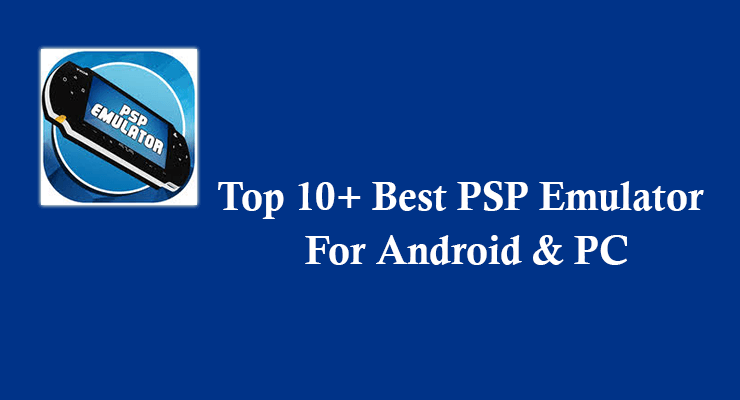 The icing on the cake is their Advanced ROM browser where you can discover all sorts of ROMs and can also classify them on the basis of a lot of aspects. You have games to choose, systems, chronological order, genres, safety rating and a lot more. Emuparadise features plenty of consoles for the ROMs like Atari, Capcom Play System, Sega Model 2, Nintendo GameCube, MAME and a plenty of handheld consoles too. You can discover more about other ROMs and some miscellaneous additions too. In fact, the site features a full ROM set in a single file which I think the most any site can offer. You can download everything for free and you need not to even register on the site as well. The next one which can be called one of the best rom website is ROM Hustler. Make sure you get yourself signed up on their platform to enjoy some member only benefits. But of course, it is a totally optional process. 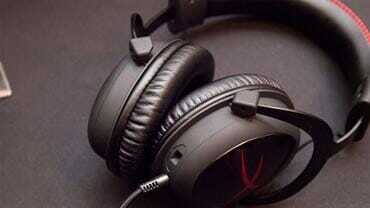 Talking about the website, then it is completely safe to download ROM files from here for various games and consoles. Although the interface is simple but ads are regular in order to generate revenue. The site is in fact contains a very huge database of not only ROMs but also that of games and emulators too. Some of the examples of the ROMs available for various consoles here are Dreamcast, PSP, Sega Genesis, Neo Geo and hundreds of more such options. You can enjoy retro games and even those ones too which are no longer in existence anymore. This is a great idea to create a virtual space in your system in the easiest way possible without even having to spend a single penny on it. CoolROM has been around the corner since a really long time and although nobody knows about the real owner of the site, it is still one of the most browsed website for ROMs. There is no doubt that CoolROM is amongst the safe rom sites but there are issues reported timely. However, most of the users think that the site is a great platform to find ROMs of the classic games of various consoles and their files are clean too. 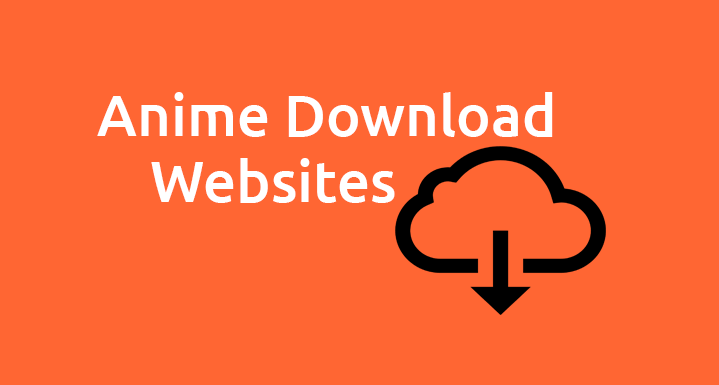 So, you won’t have to worry about any issues while downloading content from the website. There is no sign up process on the site and you can directly download the ROM file of consoles like MAME, Sega Dreamcast, Atari Jaguar, CPS1, PSP etc. However, I found a big loophole here which is the fact that CoolROM does not provide any ROM file of Nintendo console. This one is a major let-down as there are plenty of classic games belonging to the various consoles of Nintendo. People are usually skeptical when it comes to discovering ROM or ROM Games or Emulator sites and this is why there are very few safe rom websites that we can trust upon. But seems like Romsmania is one of them. The site contains a great database of ROM files as well as that of emulators too. You can find hundreds of ROMs here belonging to a variety of consoles like Neo Geo, Nintendo Wii, Atari 800, PSP, Sega Genesis and a lot more. So, basically it is a combination of regular consoles as well as handheld ones. And this is why you are going to have the option to play all sorts of classic games on your PC only no matter which is the console they originally belong to. You have a search engine on the site to look for the desired ROM file while the clean and simple interface is another bonus for you. And of course, it is absolutely free to download all types of emulator and ROM files from here. 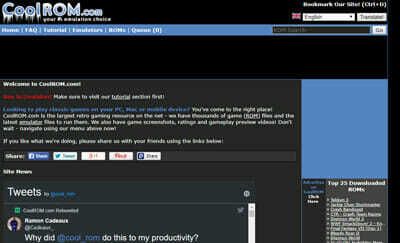 Recently a newer and updated version of ROMNation released and users couldn’t be any happier about it. The site is totally mobile friendly and provides faster navigation. Moreover, you still cannot call it a totally reliable option of safe rom sites. Many a times, intruders can make you download faulty files from their server and hence you need to make sure about the source of the file. ROMNation contains a great collection of ROMs of various consoles like Game Boy Color, WonderSwan, MAME, N64 etc. However, there are fewer options available when it comes to playing Nintendo based games of various consoles. Also, in order to get rid of ads, you would have to get registered here which is a free process. The site also allows you to share your ROM collection on their platform and in this way the content is mostly derived by user’s uploaded files. You can also comment and ask if there is any queries regarding the downloading or other things. 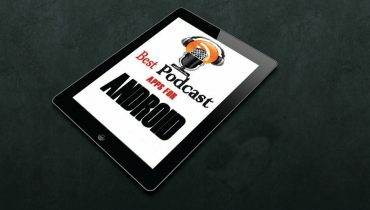 Next one in here to download best ROMs is a site called FreeRoms. Just like its name, it provides all the ROMs file to download for free so that you can enjoy all your favorite classic games. When it comes to FreeRoms, there are no complexities involved in the site. Everything is just to the point. The interface is absolutely stunning with no ads and no issues of pop-ups. All downloads are just clean and you cannot ask for anything better than this. The content of the site remains restricted to ROMs only and hence you won’t find anything else in here like games or emulators. Talking about the consoles for which you can find the ROMs are Amiga, Gameboy advance, Mame, Genesis and a lot more. All the listing of consoles is given with the number of games offered in them. In fact, you can also find ROM files for flash games too. So, basically the site a big package and does not even demand any sign up process too. All thanks to such safe rom sites like Doperoms because of which we are able to play a lot of retro games on PC as well as on mobile phones too. 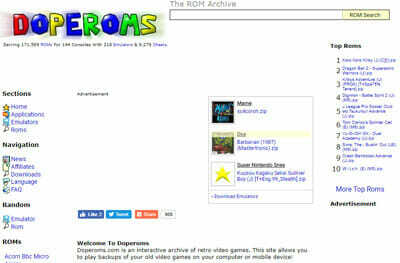 Doperoms is actually a very accomplished site which is home to various emulators, ROMs and various applications too. You are going to find answer for everything in here whether it is about emulation process or about the ROMs. And that is all provided without even the need of getting registered here. 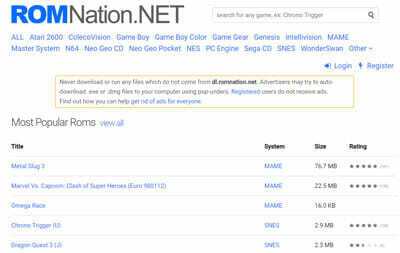 The site has this huge list of consoles for which they provide ROM files and it is all free too. If you are wondering that which game to go for then you can check out their section of Top ROM files. Each console is provided with the number of ROM files available in it. From Nintendo to Sega and to variants of PlayStation, you can find everything in here. In fact, it was actually kind of surprising to find so many consoles here which I did not even hear about. I am sure this is a perfect opportunity to relive the classic era of gaming once again. There is no way one cannot know about the best ROM site which is Emulator Zone. Although people mainly prefer it for downloading various types of emulators but that does not mean that Emulator Zone does not host a collection of ROM files. 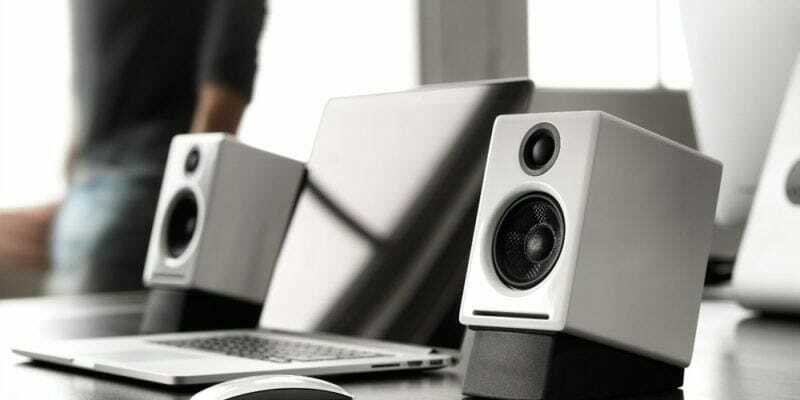 The site also adhere by strict policy of only legal content. And hence all the illegal files as well as questions regarding obtaining them are deleted straight away. Of course, this is the main reason that it is completely safe to download ROMs from this platform without the issues of malware. The site hosts a number of ROM files of various consoles like Neo Geo, Sony PlayStation, WonderSwan, Nintendo etc. However, when it comes to the games regarding all these consoles, the database is kind of disappointing. The variety remains massive in terms of emulators but not in terms of ROM files and this is why you can prefer other sites over this. I really loved the interface of Romulation which totally backs the fact that it is amongst the safe rom sites. You can sign up on the site and become a member of their community to take part is discussions and clarify your issues. 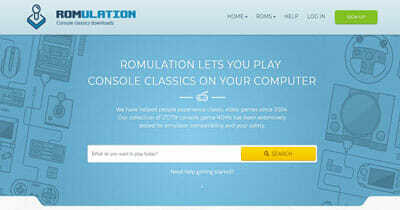 Romulation is all about playing the classic games which are no longer in development but remains to be super popular. And of course, it is just impossible to buy the consoles for each of them. So, instead of buying the console, you can simply download their ROM file through Romulation to play them on PC or on mobile phones. If you are wondering that which console to go for then you can check out the list of popular games on their site. In order to stay updated with their database, you can check out the list of newest games uploaded on the platform. Apart from it, you can directly select the console type too like PSP, Sega Genesis, NES, Nintendo 3DS and many more. 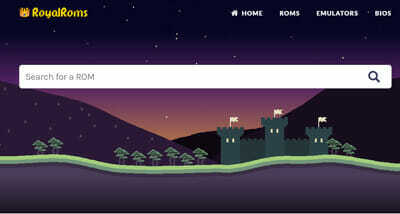 RoyalRoms makes the final pick for the list of best rom sites and this one is a home to the collection of emulators and ROM files altogether. They mainly focus towards keeping up with the database of classic games so that you can literally relive that era again. ROMs or ROM games are surely quite popular amongst the gamers these days and it is surely a great benefit to be able to play them on your PC only. In fact, you can easily play them on PC, Mac or even on Android devices too. You just need to simply download the ROM file and load them on the emulator to play easily. And this process is absolutely free on RoyalRoms and they host a huge library to choose from. 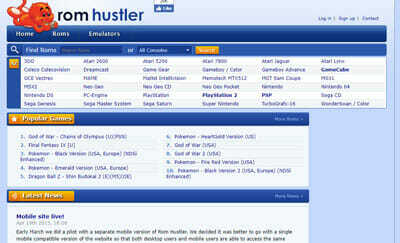 Apart from the list of ROMs, you can also browse categories like Most Recent ROMs, Top Downloaded ROMs, Most Popular etc. And if you are still confused, simply open the list of ROMs and select on your own through the filters provided. 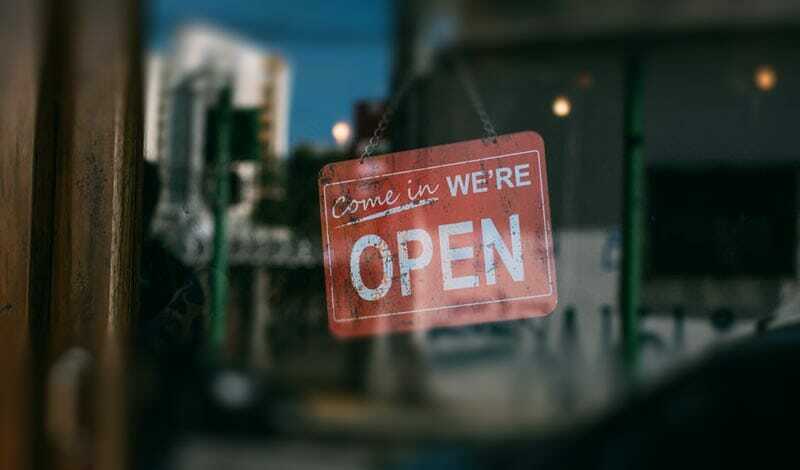 It might sound you tricky at first to understand the concept behind these safe rom sites but in reality it is pretty simple. You simply create a virtual ROM space for different types of consoles as it is impossible to have the hardware of all them in reality. So, basically it is quite like creating a virtual space to play the games of a specific console. And in this way you get to play all of your favorite games and even retro games too which are no longer in development in the current time. 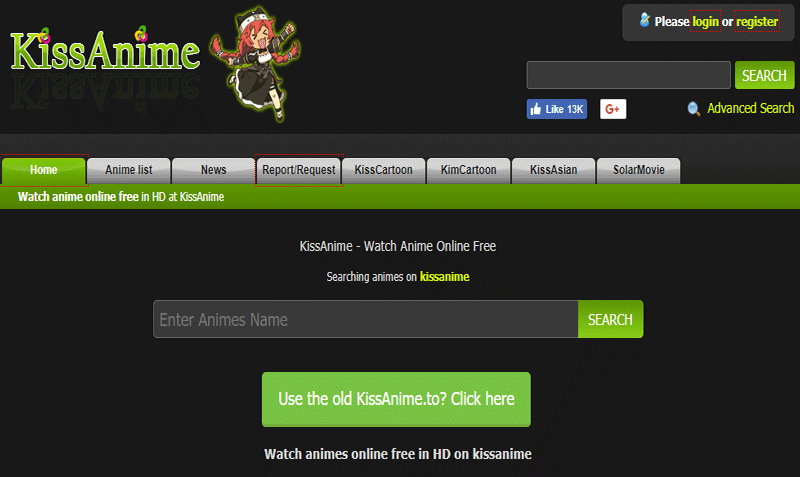 For a die-hard gamer, these ROM sites are no less than legit gold.